Artist’s depiction of the pregnant Ichthyosaur, with cutaway revealing embryos. An analysis of the fossilized remains of an Ichthyosaur—a Jurassic-era aquatic reptile—has revealed the presence of between six and eight small embryos packed within its ribs. It’s the earliest evidence of Ichthyosaur embryos to have ever been found in the British Isles. The fossil, embedded within a small boulder that was broken in half, was discovered eight years ago near Whitby in North Yorkshire. Its owner, Martin Rigby, had a feeling that some of the tiny bits of bones contained within the fossil might be traces of unborn embryos, so he brought the fossil to the attention of University of Manchester paleontologists Mike Boyd and Dean Lomax, who took a closer look. Their investigation, published this week in the Proceedings of the Yorkshire Geological Society, confirmed the presence of six embryos, and the likely remnants of another two, each measuring about four inches in length. The size of the mother could not be firmly established due to the poor preservation of her remains, but Ichthyosaurs grew to upwards of 13 feet (four meters) in length. It’s the first time paleontologists have discovered the fossilized remains of a pregnant Ichthyosaur (pronounced “ick-thee-oh-sore”) in Yorkshire, and it’s the earliest occurrence of Ichthyosaur embryos in the United Kingdom, dating back some 180 million years. The fossil (left) and the location of the embryos (right). The bands that streak across the fossil are the mother’s ribs. Ichthyosaurs were a group of carnivorous aquatic reptiles that fed on other reptiles, fish, and marine invertebrates, such as the squid-like belemnites. These creatures didn’t lay eggs, but instead gave live birth to young, i.e. they were “viviparous.” This incredible adaptation meant that Ichthyosaurs didn’t have to leave the sea and maintain terrestrial-friendly physical attributes like legs and feet (unlike modern sea turtles, for example, which have to lay eggs on beaches). This meant that Ichthyosaurs could live, breed, and evolve exclusively in aquatic environments, enabling them to acquire distinctly dolphin-like characteristics a full 150 million years before dolphins appeared on the scene (this a cool example of convergent evolution, where similar traits appear in unrelated species). Some of the fossil detail. Unlike dolphins, however, Ichthyosaurs didn’t provide milk to their offspring. 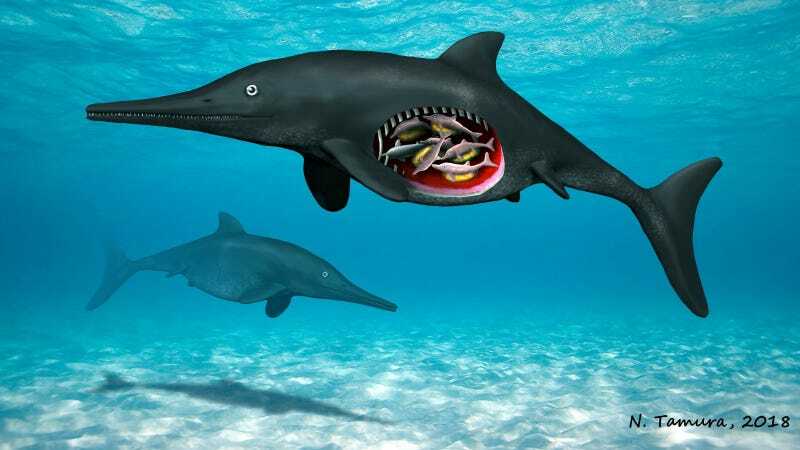 And as this new fossil attests, Ichthyosaurs gave birth to large batches of young, whereas dolphins tend to give birth to single calves; Ichthyosaur fossils have been found to contain anywhere from one to 11 embryos. Multiple births among these Jurassic reptiles suggests conditions were tough for offspring, which likely had to fend for themselves in what was surely an intensely dangerous environment; the high volume of offspring meant that at least some would likely be able to survive until sexual maturity. Ichthyosaur fossils are abundant in the UK and Europe, but before this example, only five had been discovered in Britain with embryos, and none with this quantity of unborn offspring. During the analysis, Boyd and Lomax had to make sure the embryos weren’t the result of cannibalism, and that the specimen was in fact pregnant when she died.